We live in a world full of criticism. Sometimes it comes in the form of statements or remarks from other people, other times it’s implied through images and messages passed along through media and advertising. It can be kind and constructive, or cruel and demeaning. No mater what form it comes in, to be on the receiving end is a condition of being a human in this world. There’s a certain type of criticism that people often talk about in therapy. Some people call it “self-criticism”, others call it “the inner critic”. Either way, it’s the kind of criticism that we tend to experience in the privacy of our own minds. This characteristic can make it particularly difficult to escape, and to make sense of. 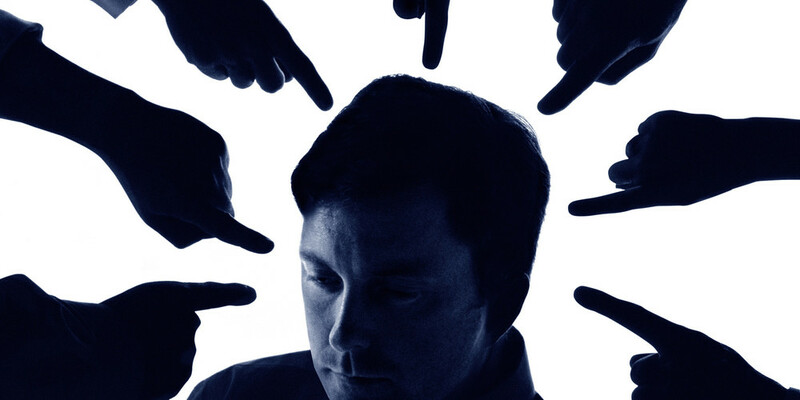 So why do we experience inner criticism? Certainly individual context is important to consider, and our relationships with our own inner critics are bound to vary from person to person. However, I’ve noticed some common themes that have emerged from the many conversations I’ve had in the therapy room with folks concerned with their experiences of self-criticism. One common (and understandable) conclusion that people often draw is that we experience self-criticism because we have low self-esteem. This is not necessarily true. Often when I ask people what they do when they experience inner criticism, their answers are very telling of how they esteem themselves. Among the myriad possible responses to the inner critic, people will describe feeling unhappy, working extra hard at succeeding, or withdrawing to prevent the possibility of the inner critic’s prophecies coming true. All these responses fit with taking a position against these unkind messages, or creating safety for oneself. As I’ve mentioned before in my posts on resistance and self-esteem, these kinds of responses fit better with esteeming oneself highly than they do with the notion of having low self-esteem. To feel unhappy in response to any unkind criticism (be it internal or external) says something about how we’d prefer to be treated. If we have a preference for kinder, more balanced assessments of our abilities and personhoods, we must see ourselves as being worthy of such. If the inner critic is not necessarily a reflection of low self-esteem, how does it come to be? 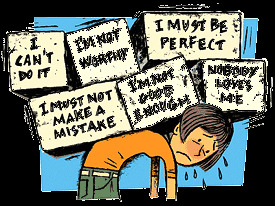 Before really unpacking the messages of self-criticism, many people will say that those messages come form themselves. There’s a sense that because we experience self-criticism in the privacy of our own minds, the words and messages that go along with it are of our own authorship. However, for the overwhelming majority of people I meet with, a little bit of conversation often exposes who is (and is not) responsible for the content of the inner critic’s messages. Imagine you’re going through your usual daily routine. First thing in the morning, you have the radio or TV on in the background and you hear a song that is as irritating as it is catchy. For the rest of the day, no matter where you go, you can’t get away from the song. It seems to be playing everywhere! Finally, at the end of day, you’re home and doing whatever it is you do to unwind…and then it hits you! That terrible song has become a part of your inner repertoire, and it’s now playing on repeat in your own head! What has been heard cannot be unheard. As human beings, we have this amazing ability to remember stuff. Of course, our memories have their limitations, but generally speaking, when we have an experience, it gets filed away for later reference. Criticism is a kind of experience too, and just like that irritating song (which we certainly didn’t invite into our consciousness), once we hear it, it cannot be unheard. Thus, when we’re in situations that resemble other instances in which we’ve received criticism (if even in some abstract way), those messages can reappear, whether we like it or not. To put it simply, the inner critic is a reflection (or reproduction) of the many critical messages we experience and respond to in the social world. There is rarely anything original about its messages, which can often be traced back to salient, pervasive, or traumatic experiences involving criticism, humiliation, and a lack of safety. Self-criticism rarely comes into the picture when people are feeling comfortable, safe, and at ease. In fact, I don’t think I’ve ever heard anyone say that their inner critic is a bother when they really feel like all is well. Instead, the inner critic is far more likely to make an appearance in response to a sense of danger. Criticism can be motivating. When we self-monitor our own performance in precarious circumstances, we can be especially careful with the words and actions we choose. This bodes well for surviving adverse experiences. We often go on the defensive in response to criticism. By shoring up our defensive resources, we’re better equipped to mitigate discomfort, pain, and harm. Criticism can help us keep from getting in over our heads. When the inner critic comments on our abilities to handle challenging situations, it can serve the purpose of avoiding feeling overwhelmed. Whatever the reason, the inner critic often pipes up when we’re feeling vulnerable. On one hand, this can serve important protective functions, while also imposing some limitations we might not be happy with. Based on conversations I’ve had with people about their experiences with self-criticism, I can understand the value around creating safety, but also their sense of discontent with the way in which that safety is established if it gets in the way of things that are important to them. 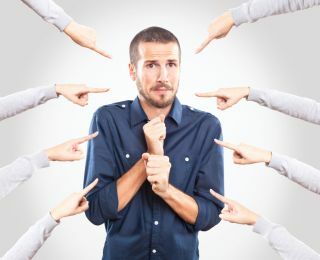 It can be useful to remember that although the vast majority of people (if not all of us) have experienced inner criticism, not all inner criticism is created equally. By this, I mean that the context and meaning behind my self-criticism is almost guaranteed to be different than yours. Therefore, how we respond, what helps, and what doesn’t, will differ from person to person, and situation to situation. I shore up examples of exceptions to the self-criticism as a way of establishing balance. If you have helpful ways of responding to your own inner critic, I'd love to hear about them! Share your knowledge by leaving a comment below.